Toyota has been making its beige-tacular Camry since 1982. Not once during those 35 years has anyone said “Wow, look at that Camry.” While the 2018 Camry is moving in a new direction with more aggressive-ish styling, Toyota’s midsize sedan has historically been just a reliable car and nothing else. It’s a store-brand means of conveyance for people who just need “something” to get to work. And that’s not really a bad thing; it fulfills its purpose very well. One generation, however, stands out in the sea of cars suitable for sitting in Park N’ Ride. That’s the XV10 Camry, made from 1991-1996. This was unlike previous Camrys. 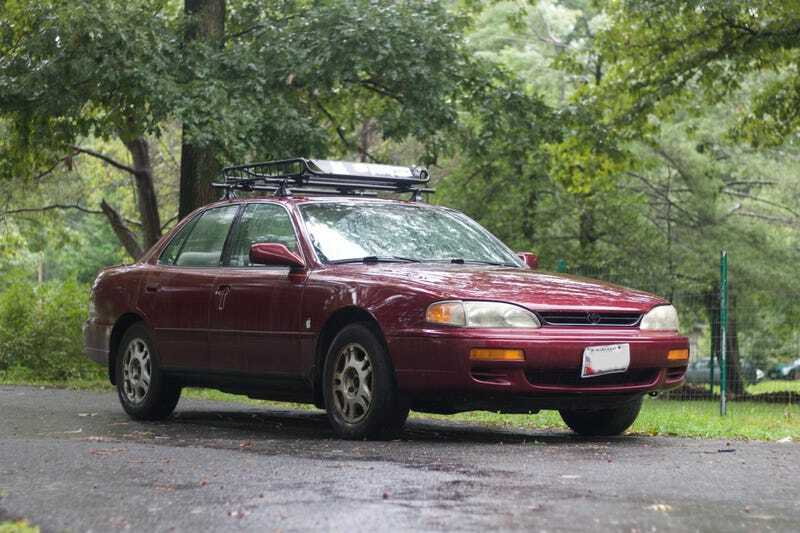 It looked much more aggressive than the previous boxy Camry and was available in a sedan, a wagon, and even a coupe. XV10 Camrys were available with an inline-four and a V6. It’s the best Camry ever made. I know this because I own one. I am a car enthusiast. I like dumb and fast cars as much as anyone on this website. My first car was a 30-year-old turbocharged LeBaron convertible that I bought off Craigslist for less than the price of a decent refrigerator. Yet my daily driver is a 1996 Toyota Camry V6 LE. Why would I choose a Toyota Camry as my everyday car? Well, my specific Camry was extremely cheap. I bought it two years ago from a church pastor for $500 after the “A Tree Fell On It” discount. Luckily the damage was minimal and it was driving after a new set of tires and some exhaust work. When I bought my Camry, I expected it to be a disposable beater car that would last a couple months. Years later, I was proven very wrong. My Camry has endured all manner of torture that would make other cars cry. It’s been hit by two large SUVs (a Chevy Tahoe and a Ford Explorer respectively), and again, a tree fell on it before I bought it. It spent a summer driving on Detroit’s less-than-stellar highways and has lived most of its life driving on Maryland’s often unpaved back roads. This Camry will probably outlive me, my children, and my grandchildren. In that time, I’ve gone through both CV joints and the suspension needs attention, but it has never left me stranded and will go on a several hundred-mile road trip without any complaints. It can even fit five normal-sized adults and their luggage in its black hole-like trunk and cabin. Did you know that if you fold down the back seats of a Camry, you can fit an entire bicycle INSIDE the car? To compensate for this, I’ve equipped my Camry with a few “creature comforts” to make trips more comfortable and the car itself a little more usable. For example, installed a state of the art 30GB entertainment system in the dashboard (I velcroed an iPod Nano to the cupholder) and I attached a roof-rack to increase its already nearly infinite cargo capacity. It is now a Lexus, basically. So the next time you see an XV10 rolling around, don’t immediately dismiss it because that will probably outlast the heat-death of the universe and keep on rolling. That’s why it’s the best Camry.